Install AWStats here. Be sure to change the default installation path to: “C:\AWStats”. If you let it go into ‘Program Files’, you’ll run into trouble in step 5 below as the path with ‘Program Files’ has a space. Trust me, I tried it. I’m sure there’s a work-around, (please post your comments about a solution!) but after spending 30 minutes with various quotes, etc. I gave just up and moved ahead! Create a new default configuration file. Edit the default configuration file with notepad. Run notepad as Administrator. Verify SiteDomain and HostAliases vars. A couple notes here about why step 8, the statistics build, didn’t work. First, in step 5, I was using “W3SVC1” instead of “W3SVC3”. The number at the end indicates the site. The site I’m using is site 3. Second, I selected additional fields to log several days ago. This changed the format of the file from its original state. So, the build program had problems recognizing the older record formats. To solve this, I moved all of the old log files out into another directory so that only the files with the newest format are being used in the database. Open Command Prompt (cmd) with Administrative Privileges and navigate to “c:\AWStats\wwwroot\cgi-bin” and run “awstats.pl -config=www.yourdomain.com” **If it runs successfully, you will get Phase 1 …, Phase 2 …, Jumped lines …, Parsed lines …, …, Found 804 new qualified records. Run “awstats.pl -config=www.yourdomain.com –output –staticlinks > ..\yourdomain_com_stats.html” **remember to use “..\” to build the html file in directory above. WARNING: LastLine parameter in history file is ‘20100426184511’ so in future. May be you need to correct manually the line LastLine in some awstats*.www.larrybrouwer.com.conf files. Create/Update database for config “C:\AWStats\wwwroot\cgi-bin/awstats.www.larrybrouwer.com.conf” by AWStats version 6.95 (build 1.943) From data in log file “c:\awstats\tools\logresolvemerge.pl c:\inetpub\logs\LogFiles\W3SVC3\*.log |”… Phase 1 : First bypass old records, searching new record… Searching new records from beginning of log file… Jumped lines in file: 0 Parsed lines in file: 804 Found 0 dropped records, Found 0 corrupted records, Found 804 old records, Found 0 new qualified records. I tried –6 first, but got the same result. A Wikipedia explanation here is useful. Daylight savings is the culprit, so I changed the parameter to “–7”, and it worked! I’ve temporarily put it at http://www.larrybrouwer.com:81/stats/larrybrouwer_com_stats.html for viewing. Sadly, clicking on this link won’t work since DNN is re-writing the URL. Bummer! It’ll be changing the link in the near future anyway when I integrate it into my DotNetNuke site. One final note… While trying to integrate AWStats into DNN, I stumbled upon the logging features in DNN. Logging is not turned on by default now as is outlined in this post here. Per this post, to enable logging, as administrator, navigate to: Site Settings \ Advanced Settings \ Host Settings \ Site Log History and change it to a positive number representing the number of days you wish to have logs kept. To view the logs, click on Admin then select Site Log in the Basic Features section. I’ve noticed that the gifs aren’t showing up in the viewed pages. So I went poking around through the installation document that comes with the software. It’s located at c:\AWStats\docs\awstats_setup.html. It probably would have been best to follow these instructions first as it describes in detail my current problems. It also discusses how to set up the log file just for AWStats use (i.e. disabling all the unnecessary fields). So I’m going to fix my installation for IIS7 using the documentation that came with the software. 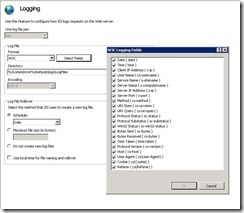 Configure IIS7 to create logs in the “Extended W3C log format”. I’m leaving my log file formats the way they are. Since I’ve already re-mapped the fields, no need to change them again. Copy the contents of AWStats cgi-bin folder to your server’s cgi-bin directory. In my case I have two websites running. So I created new cgi-bin dirs for each site. Copy the icon directory and sub-directory contents to the target website root folders. Again, I copied the icon folder to my two sites. Create a configuration file. I’m using the one I’ve already configured. Edit your configuration file. LogFile values remain the same; LogType=”W”, stays the same; LogFormat stays the same; Change the DirIcons parameter to reflect the relative path of icon directory. In my case, I don’t have to change the location since I’ve now moved the icon dir to the proper location off the root directory. Now the icons are showing up fine.